Although I'm a little late with wishing everyone a Happy Hallows Eve or Halloween, I thought it's never too late to share this great article from the internet that addresses what Halloween is really about. The article is titled How Halloween Can Be Redeemed . "Halloween has grown into a major secular holiday in American culture. But for those who don’t value devotion to the saints, the Eve has become "hollow" instead of "hallow." The purpose behind it has been lost—like celebrating New Year’s Eve without a New Year’s Day. Take away the saints and our beliefs about the dignity and destiny of human beings, and the only thing left is pre-Christian superstition regarding the dead. Among many Christians, there has been concern that things have gotten out of hand. After all, doesn’t Halloween glorify evil? Is it right to send our children out as devils and vampires, or is it better to emphasize the saints, whose nearly forgotten feast day is the reason for Halloween? Hallow is the same word for "holy" that we find in the Lord’s Prayer, and e’en is a contraction of "evening." The word Halloween itself is a shortened form of "All Hallows Eve," the day before All Saints Day. In this Update we’ll consider how Catholics can "redeem" Halloween. This holiday, properly understood and celebrated with all of its fun trappings, can be a way for us to deepen our understanding of our faith. The key to this understanding is close at hand for Catholics in our love of the communion of saints." My family enjoys all the festivities surrounding this holiday and focuses on All Saints Day. My children love to dress up and candy so Halloween is an exciting time for them. They also enjoy learning about the lives of the saints and dressing up as their favorite saints. Today, Nov. 1, our homeschool group celebrated All Saints Day by attending Mass in their saint costumes, then we had lunch and played lots of saint games. One game was a guessing game where each child stood up and gave 3 clues for their saint and their peers had to try to guess which saint they were dressed as. It was a fun day to celebrate the lives of all those who were passionate followers of Jesus. I LOVE learning about the lives of the saints with my children. Their stories are amazing, inspiring, and these are the real role models I want my family to follow. "Pin the Shamrock on St. Patrick"
Lots of Holy Cupcakes! We colored copied holy cards of all different saints, laminated them, and then taped them to popsicle sticks. Join No Ordinary Blog Hop in November by clicking button below! 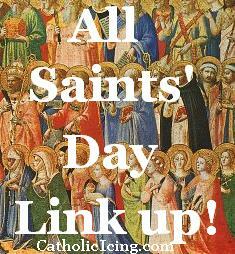 I'm also linking this post to Lacy's All Saints' Day Link Up! I am bookmarking this post! The article you cited is such a wonderful resource-- definitely one I want to have access to in the future. Glad your family had both a good All Hallows' Eve and All Saints' Day. Love the costumes and the All Saints party. It looks like your group had a great time together! Hi Tracy, you have a lot of great ideas to celebrate All Saints Day! I'm sure the children learned a lot about the saints. Hi Tracy! Thanks for sharing this on my link-up! You have a lot of cute games and costume ideas! It's so to see the kids enjoying their faith with friends! God Bless! I love the birds in the tree idea. Where did you get the print out of birds? Thank you very much. I am in charge of of our parish's first ever All Saints Day party. I'm going to get one of the teens to paint the tree for me!